It was mainly curiosity that brought me to the Mod Club last night to see Joanna Newsom’s sold-out debut Toronto (and Canadian?) performance – I’ve heard very little of her material before and wanted to see for myself what the commotion was all about. Sure, I could have just picked up a CD and listened to that, but where’s the fun in that? Toronto’s Ohbijou scored the choice opening slot on this night and they were an excellent choice. They impressed the hell out of me at V Fest and not surprisingly, sounded even better in the intimate club setting than on the massive festival stage. In these environs, you could truly appreciate the intricacies of their songs, in particular how intricate and perfect their arrangements were – horns, strings and glockenspiels were all placed and played perfectly around the more standard guitar, bass and drums. The songwriting was evocative of hiding under dark and cozy blankets in the middle of the woods at night and while they got a little bit same-y over the course of the set, doing variations on one thing really well is hardly a fault, especially at their young age. Considering how good as they are now, It blows my mind more than a little thinking of how good they can and will be. Their CD is Swift Feet For Troubling Times. I still need a copy and so do you. The general concensus seems to be that you either love Joanna Newsom to death or you can’t stand her and the reason most often given for the latter opinion is her voice. Now while at very first listen, it’s obviously a little unusual but certainly not as big a deal as some naysayers would have you believe – after the initial reaction passes, it’s really not a thing at all. And it’s perfectly suited to what she does, which is sing epic-length songs cascading with wonderfully evocative imagery, both mystical and mundane, and accompanying herself on harp. She’s so utterly unique that a more coventional voice would almost be a wasted opportunity. Her set was short – barely an hour including encore – but immensely satisfying. And considering I was a newcomer to her music, I can only imagine how enraptured her devoted audience (which is to say most everyone else there) was. She played songs from both her first album The Milk-Eyed Mender and the new one, Ys, which isn’t out til November 11 and was utterly charming and adorable in-between. Yeah, if you couldn’t tell, I was won over and even though I just saw her, am a little envious of those who’ll be seeing her in Montreal tonight. I am also understanding why so many people are shortlisting Ys for an album of the year and why she’s so beloved. 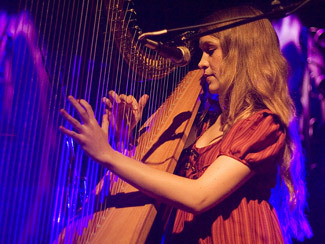 I hate to be just another voice in the chorus, but… Joanna Newsom. Amazing. eye ran an interview with Newsom last week in advance of last night’s show. eye and The Ottawa Sun introduce their readership to Under Byen. They will be opening for Newsom in Montreal tonight as well as Giant Sand on Saturday night. They’re also in Toronto with Giant Sand on Monday at the Horseshoe. PopMatters and New York Press interview John Roderick of The Long Winters. Not that this information does you any good now, but they played Lee’s Palace last night. More useful is the fact that my Barsuk contest, wherein you can win a copy of the new Long Winters CD, is still ongoing. So go. Billboard gets a preview of the new Rilo Kiley album, due out in the first half of ’07, from Jenny Lewis. Expect a taste of the new material when she plays Trinity-St Paul’s on Saturday night… but probably not the rocking ones. NOW talks to Lewis about life in the solo lane. Pitchfork, The Malaysia Star and The Seattle Times interview TV On The Radio. CMJ also think Mew is weird. Texan troubadour Micah Hinson is booked for a show at Lee’s on November 7 with Oakley Hall as support (their third show in Toronto in four months). I *SO* want one of these. Huh. Ohbijou remind me of a more lo-fi Eisley… Pretty stuff, I like it! I’ve only just fallen in love with The Milk Eyed Mender. It’s a stunning album and I hate myself for not realising that sooner!